[M, Disney, Destructive, Non-Anthro] Bolt's Secret Power- The Comic! Here is a comic rendition of AMTW03's Story A Secret Power ! 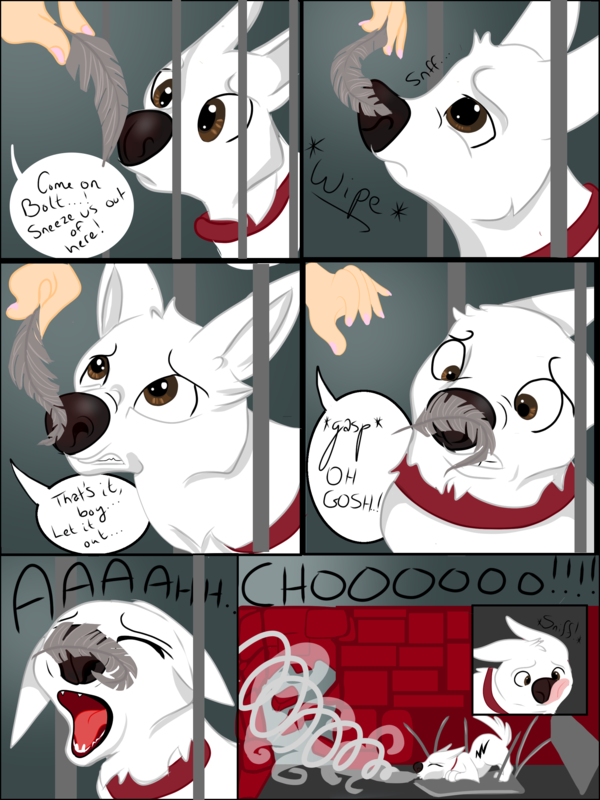 Penny and Bolt are trapped in a locked room, and they need to get out! They may be able to use Bolt's nose! This was so much fun to draw! He commissioned it yesterday, and I was able to begin and finish the comic the same day. I hope you all enjoy and if you do, my commissions are still open, so please fee free to message me! Re: [M, Disney, Destructive, Non-Anthro] Bolt's Secret Power- The Comic! I love it!! That looks soooo cute, and you did a great job capturing the climactic scene from the story. You drew Bolt's likeness very well, right down to his big nose. And I love how you show him sniffing, having his nose twitching, his muzzle scrunching, and the feather stuck to his nose. I've been wanting to see someone draw this scene for a long time now. Thank you once again! I'm so glad you like it! It was a pleasure! Oh my goodness, how did I miss this?? love, love, love! !